FIND SOMEONE WHO HAS BEEN THERE AND DONE THAT. Humans are funny creatures aren't they? HUMANS OFTEN IGNORE THIS EVOLUTIONARY BENEFIT! We take this fact for granted, and our progres suffers for it. Take WordPress for example. It is a super powerful website platform that is used by millions of people. Still though, you see people making the same mistakes, or wasting time doing everything trial and error. There is certainly a positive feelign when you accomplish something on your own, so I get it. However, in the spirit of efficiency, why not avoid some of the common pitfalls, by learning from the people who already put in the "trial and error" time. In fact, why not start at the top and learn from WordPress experts who have made fortunes from humble beginnings? 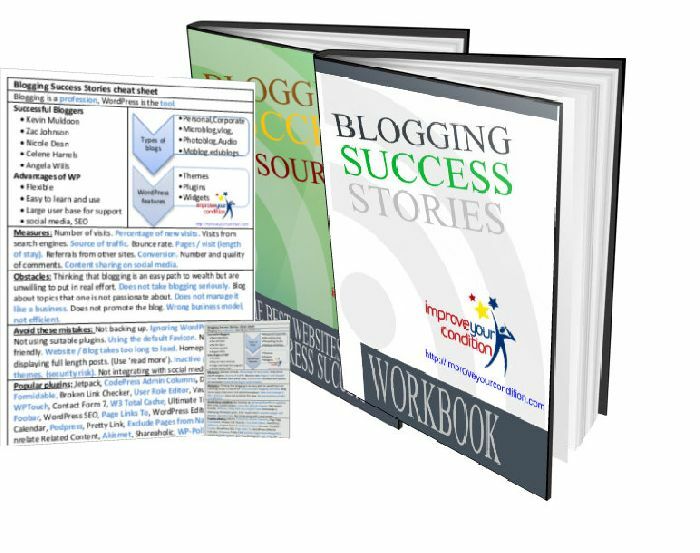 BLOGGING SUCCESS STORIES - "SUCCESS WITH WORDPRESS"
This 34 page eBook showcases four massive success stories that were born from a simple WordPress blog. Each story will present you a chance to learn form people who started much where you are. Get insight from people who have been to the top of the mountian. If you want some inspiration and are willing to learn from the experiences of others, click the download button below for instant inspiration! A PDF of the video slides summarising the EBook, The Blogging Blueprint, Measures & Obstacles and much more! All this for a simple, all inclusive price of £9.99!